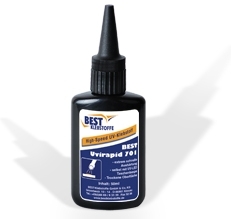 BEST-Uvirapid 701 is an innovative, one-component, solvent free and low viscous UV-highspeed adhesive based on a modified acrylate-ester. BEST-Uvirapid 701 cures by exposure to UVA-light with a wave length of 320-400 nm and is temperature and chemical resistant after cure. It is suitable for bonding of glass and translucent synthetic materials with and among each other as well as with metals, synthetic materials and elastomers. At least one of the adherends has to be permeable to UVA-light. In open applications or castings the adhesives cures – contrary to regular radiation curing adhesives extremely fast and with dry surface. – sealing of soldering contacts in plug connectors and relays. – bonding of glass and translucent synthetics with and among each other and with metals, synthetics and elastomers.